Shakhtar, leading in the U19 league with 32 points, went on a visit to one of the league outsiders Oleksandriya, who have scored only 11 points so far (8 in home games). The opponents’ meeting in the first round ended in a major 5-0 victory for Shakhtar. 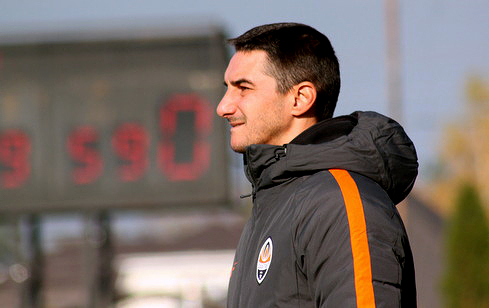 In today's match, the team of Valeriy Kryventsov could not be helped by the injured goalkeeper Vladyslav Trescheyko and striker Denys Arendaruk. Compared to the previous game against Chornomorets (3-0) the coaching staff fo Shakhtar made minimal changes to the starting line-up: Mykola Matviyenko was fielded at left back instead of Oleksandr Mihunov, with Oleksii Zinkevych replacing Arendaruk in the central forward role. The Pitmen controlled the course of the game from the opening minutes, almost completely dispossessing Oleksandriya, with the hosts backing into their half. However, the first dangerous chance was created by the Yellow-and-Blacks: after a pass from the goalkeeper, Mykolayiv found himself one on one, but did not hit the ball properly, with the latter getting into the hands of Kudryk. In response, Zinkevych checked reflexes of the Oleksandriya goalkeeper from long range, with Novak clearing it. Then Ihnatenko was taking a bicycle kick, with a defender intercepting the ball. Donetsk managed to fulfil their advantage midway through the second half. Ihor Kiryukhantsev delivered the ball into the hosts’ box and Mykyta Adamenko struck home to make it 0-1. In a similar situation, Hlushchuk could score, but failed to reach for the ball. After taking the lead, the players of Shakhtar started playing in a more relaxed manner. Zinkevych was finishing a great move with a powerful shot, but it went wide. After another passing move, Adamenko found himself in a striking position, but the goalkeeper reacted to his shot from 11 metres. As a result, the sides left for the break with the Pitmen leading narrowly. After the break, the hosts managed to level the game for a short while, however, the defence of the Orange-and-Blacks did not allow the opponents to threaten the goal of Oleh Kudryk. After gradually returning control of the ball, the charges of Valeriy Kryventsov began to create chances near the opposing goal again. Hlushchuk and then Adamenko failed to beat Novak. On 76 minutes, Zinkevych pushed the ball past the goalkeeper and was brought down on the edge of the penalty area, with the host goalkeeper being just booked for a clear desperate foul. Toward the end of the match, the Pitmen started operating more cautiously, focusing on retaining the score. At the same time, three minutes before the final whistle, the hosts almost equalised: Protasov was getting on the end of the cross at the far post, but his shot was stopped by Kudryk, who immediately eliminated the danger after a corner. The final whistle registered Shakhtar’s narrow win over Oleksandriya. A fortnight's break is coming in the league, so the Pitmen will play their next game against Karpaty on November 18. - We arrived in Oleksandriya having the leaders’ status and aimed to win only. Today’s victory wasn’t easy for us. The score was pressing us, so when we scored a goal, we asked the guys to play very neatly and cautiously in defence, just pragmatically to an extent. Perhaps, this made the second half a bit unimpressive. But we still had a good background to give the score a more lopsided look: the same Adamenko could score two or three goals, there was an episode when Zinkevych broke away and found himself one on one with the keeper, got the ball through and was brought down by the keeper, but the referee somehow did not award him a red card. Sending the keeper away, I am sure, would greatly affect the match outcome. Besides, on a very soft pitch our players felt tiredness in the feet by the end of the second half, which affected their pace and agility. The opponents were not in a hurry to charge forward and expose themselves, but they followed their game plan until the end, trying to create danger by making an all-out attack towards our goal. But we must give our boys their due, because they played seamlessly in those minutes and brought the encounter to an absolutely well-deserved victory.